Friday, April 22, was an especially delightful Earth Day to me. 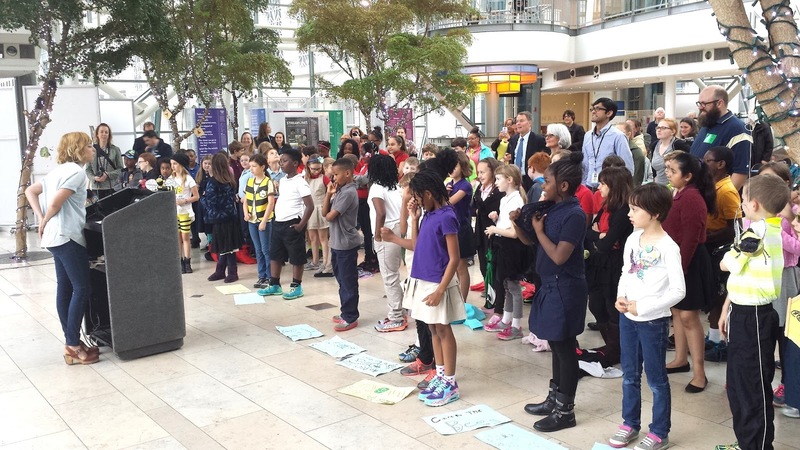 For one thing, it was kind of a normal day — thus, my "every day is Earth Day" edict. 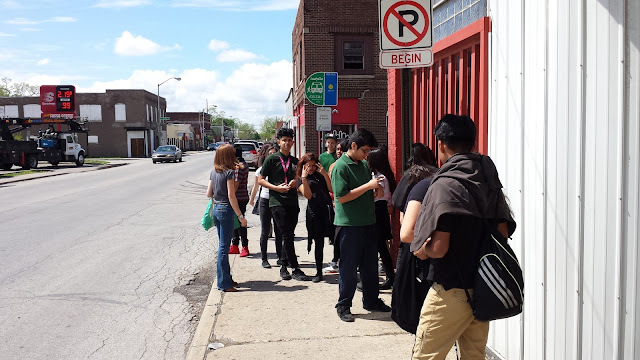 As you see from my Climate Chronicles, I often take students on field trips using IndyGo. And, I often visit Paramount School of Excellence's farm, too. 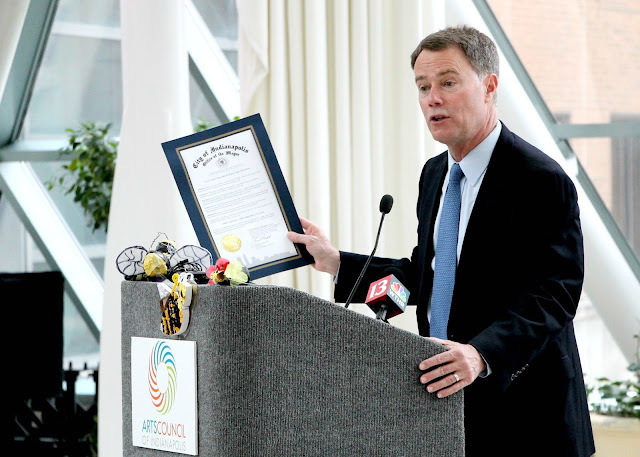 But there was a little something extra special on Friday, and that was Mayor Joe Hogsett, delivering his official proclamation that Indianapolis is "A Bee-Friendly City." Some photos from my day are below, but I think it's best we put Earth Day in context, and get some bad news out of the way. If you are paying attention to climate-related news in 2016, you know that scientists are using words like "explosive" and "shocker" to describe the current rise in temperatures, along with this story, which uses the word "unprecedented." Yeah, I know, climate's been a-changing all along, and long before humans got here to mess everything up, but the rate of change is what is so extraordinary and, we hope, moves multitudes from their stubborn insistence that this is a natural phenomenon, or that the science isn't settled. In fact, we are breaking all sorts of temperature records these days, as pointed out in this Scientific American story. Too bad we can't excited about this like we get excited about sports statistics. What's really daunting here is that the Paris talks commitments don't really kick in until 2020, and their promise to try and keep temperatures at the 1.5C rise looks endangered — even before that commitment begins. All the more reason to spend as much of our precious time working for this only planet we have. That's why I focus my attention on young people, because their role in keeping us grown ups on task is vital. So come with me to eye some images from the climate recovery front: youth inspiring each other — and adults — to work for the earth, not against it. One way to work for the earth is to care for the bees, as they are an essential pollinator. Hello! Every third bite of food we eat is because of pollinators like bees. 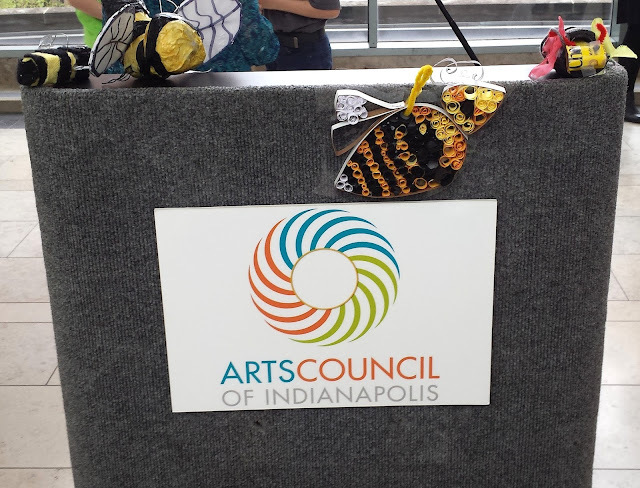 Thanks to a grant from SustainIndy, Earth Charter Indiana and Bee Public, are educating youth and adults about bees, starting bee hives in six schools, and we have an exhibit of 3D bee sculptures in the Artsgarden, thanks to our partnership with Shannon Linker and the Arts Council of Indianapolis. About two dozen schools in Indiana are participating in this exhibition. Our artists are 4th and 5th grade students, who learned all about bee stewardship as they were creating their works of art. 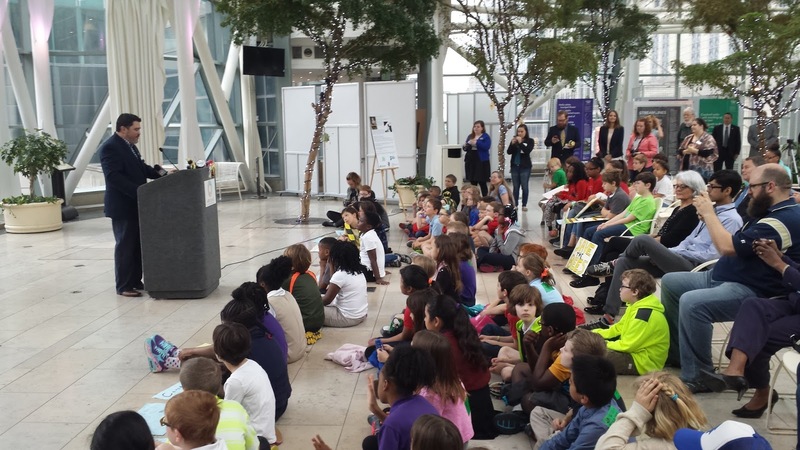 We were able to get three schools from the Indianapolis Public Schools system to attend the Earth Day event that was anchored by the aforementioned Proclamation by Mayor Hogsett. Those three schools: Butler Lab School 60, CFI #2 and Sidener Academy. 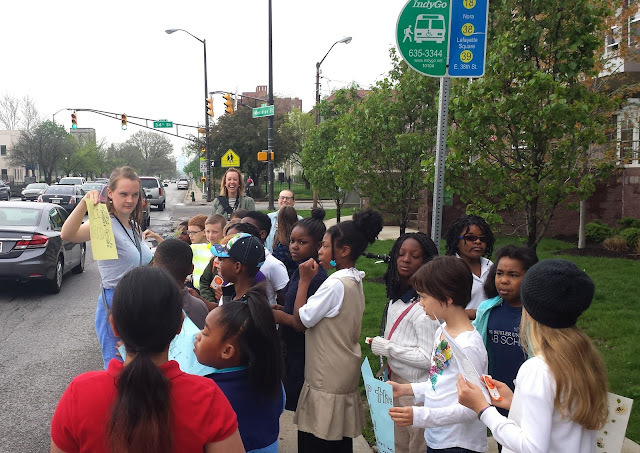 Sidener was able to arrange an IPS bus to deliver them to and from the Artsgarden, but in honor of Earth Day, CFI #2 walked to the event. Now that's a low carbon footprint! Butler Lab School decided to ... (drumroll) take IndyGo! 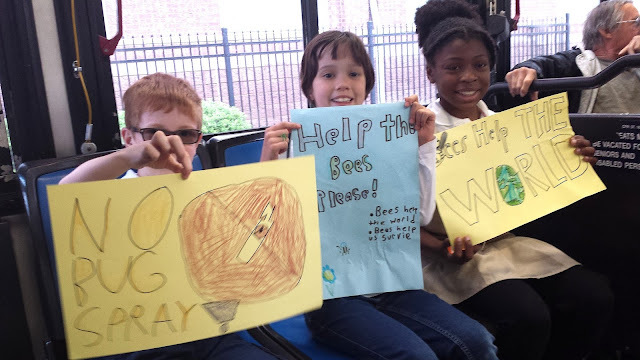 Kids made signs for the Artsgarden event, but weren't shy about showing them off on the journey there and back. Kate Franzman, left, of Bee Public, and our partner in Save the Bees, gets everyone ready to dance — just like bees do! Indianapolis City Councilor Zach Adamson, a beekeeper himself, helped write the Proclamation. He introduced the Mayor. The Mayor makes his proclamation that Indianapolis pledges to be good to bees. Fun day for all of us, Mayor Joe, Save the Bees partners and these kids! 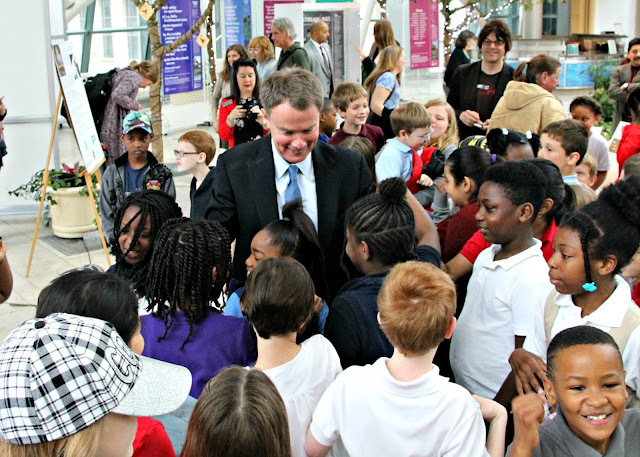 A great morning, thanks to Arts Council, Bee Public, Mayor Hogsett and all the schools who participated in our exhibition. You have until May 13 to see these bee sculptures for yourself! 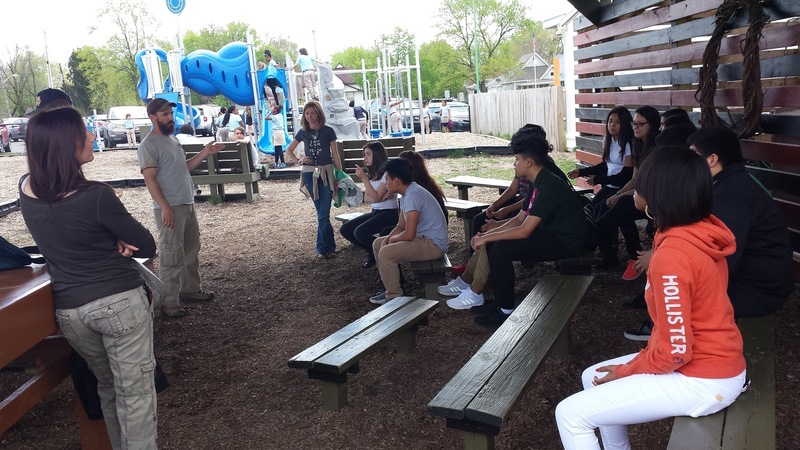 The second part of my Earth Day was with Harshman Middle School 8th graders, a group of youth taking a sustainability intensive with their art teacher, Madeline Hutchins. Madeline is one of those teachers you remember your whole life. She talks to like a real person; she believes in you; she'll do anything for you. The students love her. Over the course of this year, I've visited numerous times, and learned these students love chickens and farming in general. It was a natural idea to take them to Paramount School of Excellence which has the most developed farm associated with a school in all of Indiana. Except of course for Distelrath Farms, which IS a school AND a farm. More on Distelrath later! Always an adventure: Taking IndyGo on our field trips. First stop at Paramount School of Excellence is their outdoor classroom. Chris Larson from Paramount acclimates us. 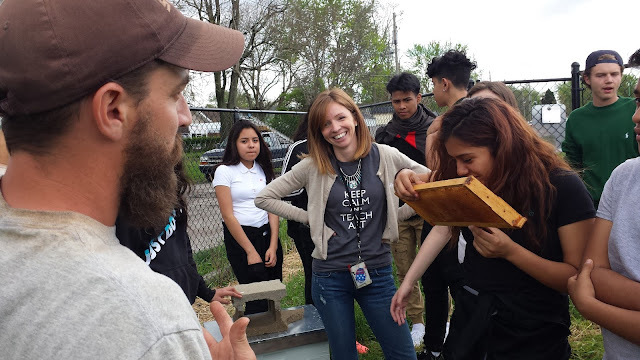 Madeline Hutchins, center, listens as Chris talks about bees. Harshman is one of the six schools getting a bee hive as part of our Save the Bees initiative. 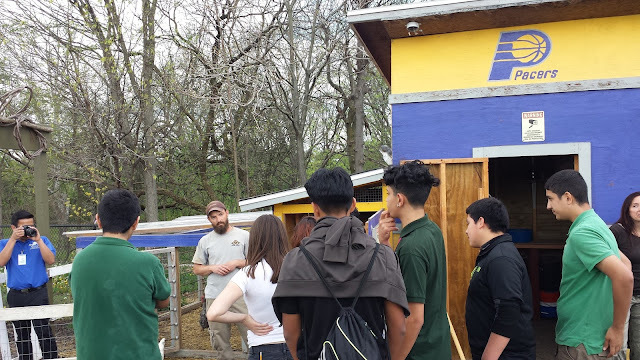 Chris talks with students about the chickens. 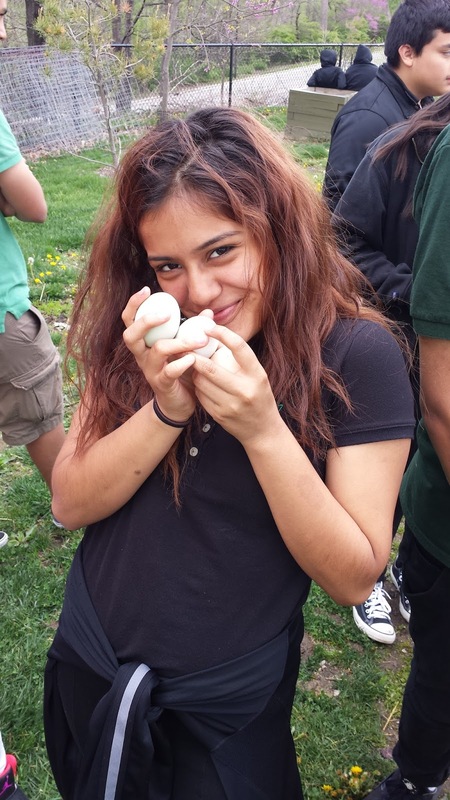 I reiterate: Harshman students love chickens, farming, and eggs! This is really great work you're doing. Most people, including me, don't know the importance bees have on the earth. Educating people is a great idea to save the bees.